Effects of the Beaver Island Lumber Company (BILC) on Land Use and Identity: As the BILC changed the environmental landscape of Beaver Island, did the people’s identities and island homogeneity change as well? The landscape of Beaver Island at the turn of the 20th century, with its forests, abundant waterways, and relatively flat land, led to the success of logging on the island. This inspired the Stephens brothers to come from Freesoil, Michigan in 1902 to establish the Beaver Island Lumber Company (Gladish 1976:94). The BILC altered the physical landscape of the island, through using up much of the island’s virgin timber and adding infrastructure (Figure 1). As the logging company altered the physical landscape of Beaver Island, it altered the social landscape and identity. The Beaver Island Lumber Company altered the community in that it broke up Irish hegemony, and it contributed to the islander identity of adapting and doing multiple things to survive. Before the logging company came, the island contained mostly people of Irish decent. In 1880, residents were from Ireland, Canada, Pennsylvania, Michigan or a few other places, such as Scotland, England, Sweden, and Russia. Male occupations were fishers, sailors, farmers, and laborers. Only fisher and farmer appeared as distinct occupations (US Census 1880). These occupations matched those the residents would have held in Ireland. Irish identity was reflected in the continuation of Irish traditions, occupations, worship, and customs. Islander identity was more about being resourceful and doing more than one thing to make a living. The broad category of “laborer” reflects this. This included adapting to changing conditions, such as the arrival of the lumber company, and incorporating new people and things into one’s way of life. Oral histories and census records were used to see if the pre-BILC islanders changed their primary occupation to logging and if they saw their occupation as indicative of their identity. They were also used to note how the islanders perceived the effect of the BILC on the island. When the logging company came, it brought an influx of non-Irish newcomers to the island along with their different customs and added income (LaFreniere 2011). The homogeneity of the Irish Catholic island lessened. A Protestant church was built to serve the newly-arrived workers, and places with non-Irish origin, such as Freesoil Avenue, company houses were set up (Gladish 1976; Hart 1976). The logging company also established further connection with the mainland, mainly Chicago and Milwaukee, which were the main destinations for lumber (Gladish 1976). This also brought the island into further contact with people of differing backgrounds. There was not much animosity toward the newcomers and logging, however, because they provided revenue (LaFreniere 2011). The company required about 150 laborers to carry out its work (Collar 2011). 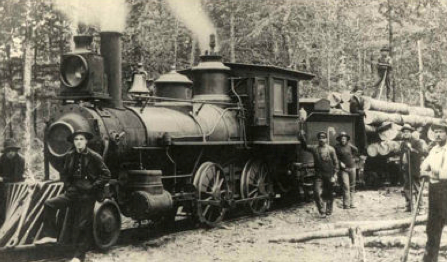 Smaller-scale logging had occurred for many years on the island, but the BILC was the largest logging operation. In one logging season, 500,000’ of lumber and 2,000,000 shingles were produced (Collar 2011). 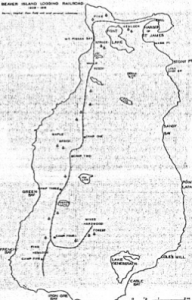 The company infrastructure included a 13-mile railroad down the west side of the island to connect the five lumber camps to the mill in St. James (Case 1938:41; Names and Places 1976:170-171) (Figure 1). In winter, the company logged, but independent loggers did too to make additional money. Although many of the full-time BILC company employees were recent arrivals, it is possible that some of these independents were the traditional Irish islanders (LaFreniere 2011). Some islanders worked at the sawmills when they were not doing other jobs. Alvin LaFreniere’s (pers comm. 2011) Irish maternal grandfather Hugh Connaghan was primarily a fisherman, but also participated in logging in the winter. His non-Irish paternal grandfather moved to Beaver Island to work for the logging company. So the identity of the permanent islanders may not have changed from fisherman to lumberjack. They may have added logging to what they did, but the census does not clearly show Irish changing their occupation. This could be because there was no concept of lumberjack on Arainn Mhor where many Irish islanders came from, the first generation Irish identified with their first (original) occupation, and because an adaptable islander may do more than one thing to survive. There was not a clear transition/identity change between fisherman or other occupation and logger. The focus was more about working together to make a living and make island life work. Although the logging company ceased operation in 1915, the changes it helped bring about remained. The 1920 census documented an even larger population, and the occupations and places of origin were even more diverse than earlier enumerations. For example, retail occupations began to appear more frequently. Farming also went from being listed as a primary occupation to being listed as a type of labor. The ones who listed occupation related to lumber were mainly non-Irish. This does not mean that the Irish were not involved in logging, however, as some Irish fishermen were listed as owning tugboats. It is known that tugboats transported softwood for the logging industry (Gladish 1976:96; Franzen 1992), so they may have been part of this economic enterprise. Some of the non-Irish loggers who came to work for the lumber company left with the company, but some newly-arrived loggers, such as LaFreniere’s paternal grandfather, stayed and integrated themselves into the community. Some took on new jobs (LaFreniere’s grandfather opened a store), which matches the theme of resourceful islanders taking on new occupations. Logging and occupations related to logging do emerge in the 1910 and 1920 censes, but they seem to emerge as an addition to the census with new arrivals, not as a change in the occupation of long-standing islanders (Figure 2). The census records did not support that people changed what they saw as their primary occupation (and thus their identity) with the arrival of the BILC. The island as a whole was changed by increased income, more connections to the mainland, more infrastructure, and more diversity. The homogeneity of the overall Irish identity on the island decreased, in the sense that more people who identified with logging arrived with the advent of the BILC and that the physical environment of the island changed, but the BILC did not cause the individual identities of the already-established Irish islanders to change. The broad category of “laborer” was often listed, which may support the theme of identity as a resourceful islander who does various jobs to survive. The identity of the islander is what predominates. Further Questions:1. Were fishing and farming considered more important than other occupations?2. How is occupation related to identity? Is it different in Ireland than America? 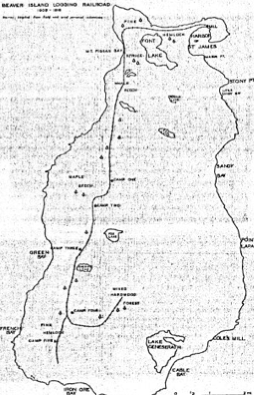 1938 Beaver Island: A Study of Insular Land Utilization. Master’s thesis. Department of Geography, University of Chicago. 2011 Beaver Island History. Clarke Historical Library. Central Michigan University. 1976 Notes on Beaver Island Logging. The Journal of Beaver Island History: Volume 1. Beaver Island Historical Society (editor). St. James, MI. 1976 The Religions of Beaver Island. The Journal of Beaver Island History: Volume 1. Beaver Island Historical Society (editor). St. James, MI. 2011 Oral Interview conducted by Kasia Ahern and Kaitlyn Davis. July 2011, Beaver Island, MI. 1976 The Journal of Beaver Island History: Volume 1. Beaver Island Historical Society (editor). St. James, MI. 1880, 1920 Population Schedules. United States Bureau of the Census, Washington DC. Interesting article but I want to point out that Alvin LaFreniere’s maternal grandfather was Hugh Connaghan…not McConnaghan.